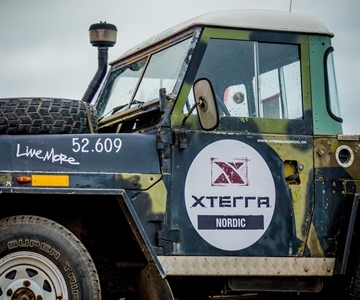 XTERRA Denmark is the last race of a very long season, 16 races spanning April 15th to September 9th, from Malta to Denmark, via Cyprus, Greece, Lake Garda in Italy, Portugal, Belgium, Switzerland, France, Czech Republic, Lake Scanno in Italy, Romania, Poland, Germany, Finland and Norway. The XTERRA European crew had a fantastic season meeting all of our organizers who work so hard to grow our sport and expose more people to the XTERRA brand. We had the pleasure of meeting so many XTERRA athletes racing with the spirit of XTERRA, discovering new places and creating many great stories. For the third season in a row, the last event of the Tour takes place at the famous cliffs on the Isle of Mon! These cliffs are famous for their impressive size and the 497 stairs athletes will have to climb from the swim exit to transition 1. The race on the island of Mon will start in the water underneath the white cliffs. The 1500m swim is two loops. There is no swim exit in the middle and the water can be choppy. You also need to be careful once out of the water as the rocky exit can be quite tricky until you reach the wooden stairs. From here you will start the long ascent up the stairs. Don’t start too fast, as you will pay for it later! The MTB course is nice, mainly on single track with some twisty sections. You will need power on the climbs as they are always short and steep. You will complete two laps before coming back to transition. The 10km run will also features two loops. First a flatter loop on single track trails with some short climbs before a second loop that descends down to sea level before crossing the beach. You will then encounter a short rock climb across some water, finishing again with the famous staircase back to the finish line close to transition at the Geo Centre. We have two favourites in the elite men’s field; last year’s second place and second place this year at the European Championship, Sam Osborne from New Zealand, and last year’s third place and also third in Zittau, Spaniard Roger Serrano. Serrano has won on 4 occasions already this season and I think these two will complete most of the race together. They will swim in the same group and can ride together but Osbourne is the better runner. Serrano will need to choose a moment to attack and create a gap before starting the run if the Spanish athlete wants to win here. Osborne can play it cool and just stay with the lead pack and use his running skills to win. Maybe Roger can count on Frenchmen Carloni and Chane to escape on the bike, as they are strong enough to break Osbourne but not threaten the run of Serrano. Max Chane will need to risk it all on the bike to better his 7th place from 2017. Francois Carloni will play it safe and just make sure he doesn’t have any problems to finish in the top 6 and win the tour. Other athletes in contention should be Xavier Dafflon, Peter Lehmann and Rui Dolores. The Swiss athlete prefers a harder MTB course but after his victory in Finland, he will start confident and can come back for a podium or at least a top 5. Peter Lehmann knows that it will be hard to keep his 2nd place on the tour in front of Roger, but also knows that he cannot lose the podium. He can be relaxed with nothing to lose and everything to gain. His second place in Norway, only 22 seconds back from Roger shows that he is in some good shape despite 5 races in 5 weeks. Dolores will be looking to show what he can do after missing a turn arrow last week in Norway. Whilst he was out of the race I saw that he was in great shape and I’m sure he will prove it in Mons Klint. We are also happy to see Geert Lauryssen back. He had a great start of the season with 4 races in top 7 and a podium at home in Belgium. For the women’s race, we know the Euro Tour is wrapped up for Carina. She has enough points to win without even racing. Carina will be here but she might not race as she twisted her ankle badly in Norway. We will have to wait to see what Carina will do in Mon Sunday. No doubt she will want to finish her series with a podium finish. She already has 15 this season including wins in South Africa, Asia Pacific Championship in Danao, Finland and Norway! If I was her, I would go to the Geo Center bar and cheer for my friends from there, telling them I will meet you later for the podium. There will be a great battle for the win. Brigitta Poor, two time European champion, 7 victories this season in 9 XTERRA Euro Tour races will start this final to win. Her main competition will come from Mexico’s Michelle Flipo, who has won XTERRA Switzerland twice and the XTERRA European championship in Germany in 2016. She is racing mainly on the road but she is also strong on a mountain bike. She was 13th last week at the ITU world cup in Karlovy Vary. It will be very interesting to see. Also challenging for a spot on the podium will be Lizzie Orchard and Samantha Kingsford, both from New Zealand. Lizzie was solid in Germany with a 4th place finish and was also on the box in Czech. With a top 3 position she will place top 10 in the Tour. Samantha had a great race at the ITU world championships but hasn’t succeeded yet in any race on the European Tour. She had an OK race in Poland with a 5th place, but I am sure she will want to put in another good performance on this last race of the tour. Ania Tomica will want to get some good points and finish the Tour in 6th place. This will also be the first Elite race for Danish athlete Heidi Thranum after a great season at regional races in Denmark. After this last event in the Euro Tour 2018, the Crew will take off for Tawain to support this event. And of course, like many of you XTERRA fans, we will wait for you in Maui, Hawai, USA, for the biggest XTERRA race of the season, our world championship.